Pre-heat the oven to fan 180C (fan assisted)/400F/Gas Mark 6. Using a sharp knife, cut a pocket down the side of each chicken breast making sure to slice halfway through the breast. In a small bowl, mix together the Filippo Berio Tomato & Ricotta Pesto and cream cheese. Season with black pepper. Spoon 1 tbsp of the pesto and cheese mixture into the pocket. Lay 2 slices of Parma ham onto a board. Lay a sprig of fresh rosemary on top of the ham and then place the chicken breast, top side down onto the ham. Wrap the ham tightly around the chicken and turn over so the seam is at the bottom of the chicken breast. Place the chicken onto a lightly oiled baking tray and cook for 20-25 minutes. Serve with a mixed salad. This recipe works well with pork and thick pieces of firm white fish such as monkfish or salmon. 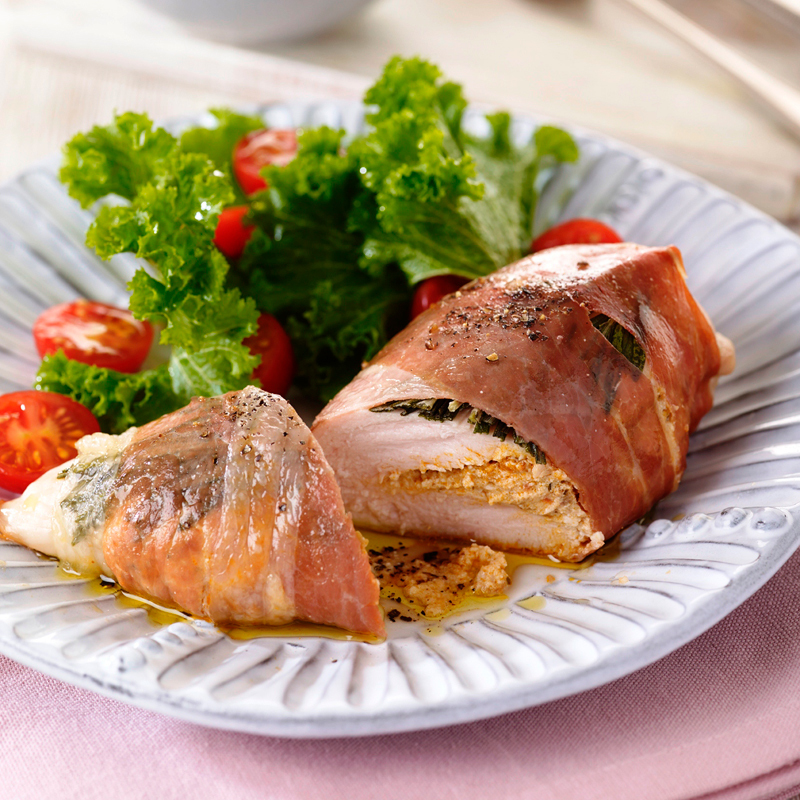 Succulent chicken breasts wrapped in crispy prosciutto with a mouth-watering tomato and ricotta stuffing.